In the marketplace, you will find a wide selection when it comes to down alternatives. These pillows are very soft yet they will absorb a minimal body heat so you get a comfortable and cool sleep at night. There are also suitable for all types of sleepers and they're also moldable so you have a pillow that is very comfortable. These pillows will conform closely to others made with more traditional materials such as latex or memory foam. Sleepers that had shoulder pain or neck pain reported fewer pressure points and aches in the morning after they slept on one with a down alternative. 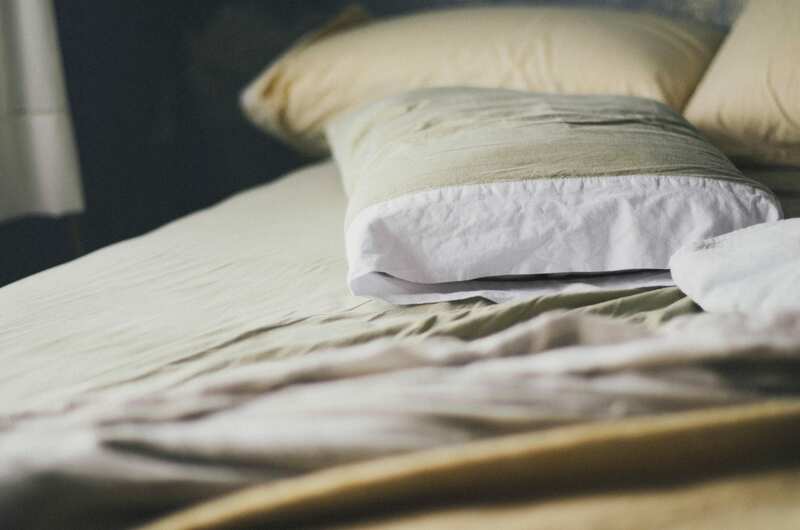 This guide looks at the benefits and common characteristics of down alternative pillows. Below you will find several of the top picks for a down alternative pillow that you can buy on the current market. The choices we have made are based upon user experiences, verified customers, analysis, and research into all of these products. 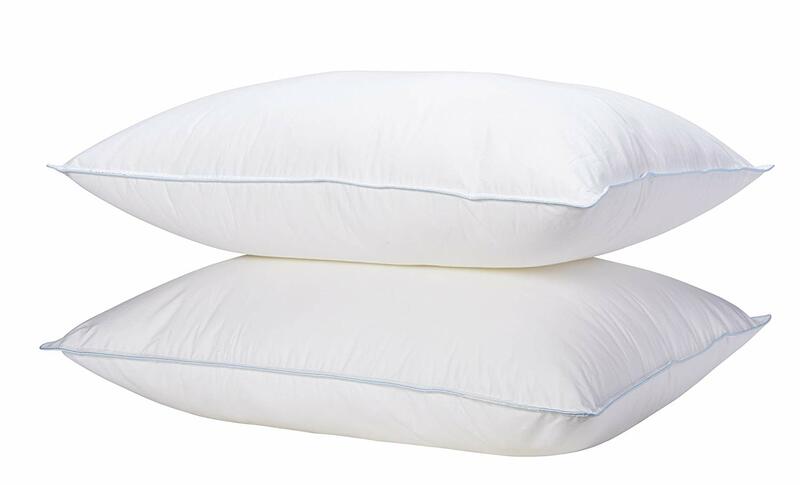 What is the Difference Between Down Alternative Pillows and Down Pillows? Who Benefits From This Pillow? Canadian Down & Feather Company makes a top-quality down alternative pillow. This pillow is perfect for most sleepers will found similar models to be to flattening or Lumpy as this one is more comfortable. the pillow itself can be machine washed and it recovers its full shape once you have washed it. The pillow is made to exceptional quality and it will have a longer life span when compared to other pillows. To keep the sleeper cool, there is a gel microfiber. this microfiber gel is coded so you will get a nice cooling sensation when sleeping on the pillow. The cover of it is made with 300TC cotton and it's breathable. The sides have a 2-inch gusseted edge and it will keep its shape. the edge helps the pillow so it doesn't flatten out like other pillows tend to do. You can get three different sizes including king, queen, and standard. You will get great support yet it will cradle the sleepers head. You can buy this product as a single or you can buy it in a bundle from many different retailers including Amazon.com. When you purchase this product, you will get a 3-year warranty so you are covered in case something happens to it. 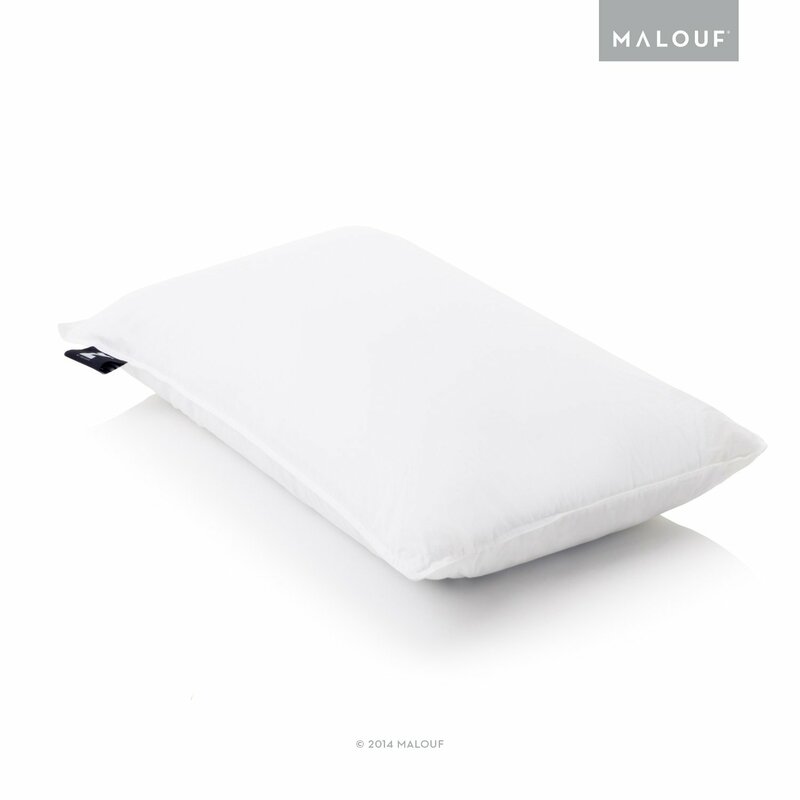 Malouf Z offers exceptional down alternative pillows. You will get a good night's rest with this pillow and you will be kept cool because it has gelled microfiber. The cooling gel will regulate the temperature so you stay comfortable at night. It also comes with a machine washable cover. 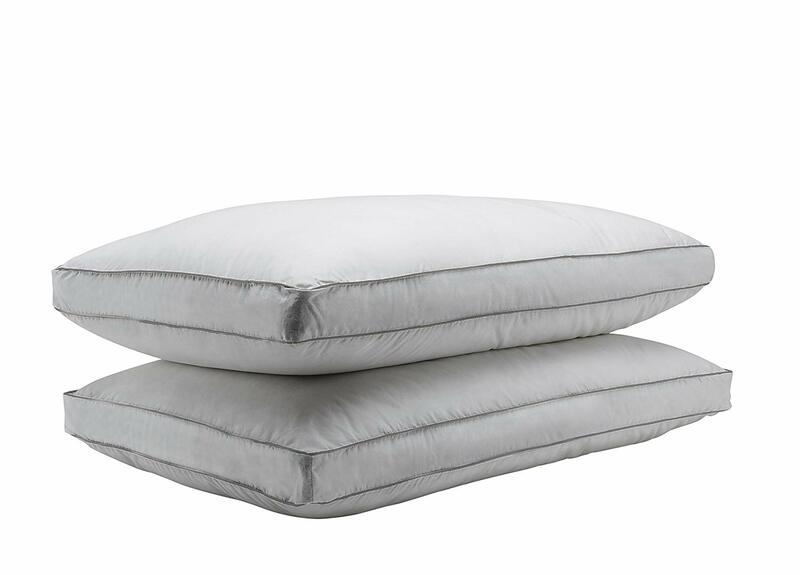 You get a medium loft with this pillow and it also comes with siliconized fill fibers which are clustered and denser than other pillows so you sink into the pillow at just the right amount but still have the support that you need. The pillow will keep its full shape thanks to the gelled microfiber. There will be no flattening or clumping of this pillow so the product will also last a long time when you compare it to other models. You can get it in body size, king size, or in Queen. The body size is perfect for women that are pregnant. In the contiguous USA, you will get free shipping with the product and you also get a 3-year warranty. These fiber filled pillows with 7D virgin grade 700g filling offer superior comfort by providing neck and head support in all sleeping positions. The finely tailored 233 thread count 100% cotton exterior is soft and comfortable enough to not require a pillowcase and will leave you feeling as well rested as a night in a luxurious hotel. These pillows are allergen free and will will help to relive for people with allergen-related conditions thus ensuring the comfort and safety of their users for years to come. These low-maintenance pillows are antimicrobial, which means that the pillows themselves prevent the growth of mold, mites, or mildew. If and when cleaning becomes necessary or desired, the pillow may be washed in a queen washing machine using a gentle, cold cycle without bleach. They may be dried in a drier using a low tumble dry setting (please remove from drier promptly once the cycle has finished). A down pillow tends to be quite luxurious as are quite squishy, plush, as well as very comfortable. You can maneuver them and scrunch them for your own personal support when you move during the night. A memory foam pillow, on the other hand, is very rigid and firmer. A down alternative pillow is a pillow that will mimic down to a certain extent but this can also be quite misleading. Here are the differences you need to understand between down alternative pillows and an actual authentic down pillow before you make your purchase. A genuine it down pillow is made with duck feathers, other waterfowl, or geese feathers. A down alternative pillow is one that is made with synthetic fibers but these fibers will mimic the softness that down provides you. If you are allergic to down, for example, a down alternative pillow is a perfect option for you. Some individuals that care about animals may also want this type of pillow because they don't want to use products that have been made from animals. A down alternative pillow is also going to cost you less when compared to a down pillow. They are cheaper to produce you will sleep cooler on them and they will produce less of an older. There are some drawbacks to down alternative pillows because they can have a lifespan that is shorter than average, they will give you less pressure and pain relief, they can be a little bit noisier than a down pillow, and they require fluffing or shaking it more often to get them back into their full shape. Most down alternative pillows are going to contain microfibers or fibers made up of polyester, cotton, or a combination of the two. These are puffy and soft fibers which will be as soft when compared to authentic down. Most of these pillows will give you a medium loft and he may have a firmness that is around soft to a medium firm. Some of the brands will feature siliconized fibers or gel fibers which will make the pillow even softer when compared to a regular down alternative. These products are also not made from animals unlike a feather or a genuine down pillow. You can get several different sizes when you purchase a down alternative pillow. Here are the common sizes and what you need to know. 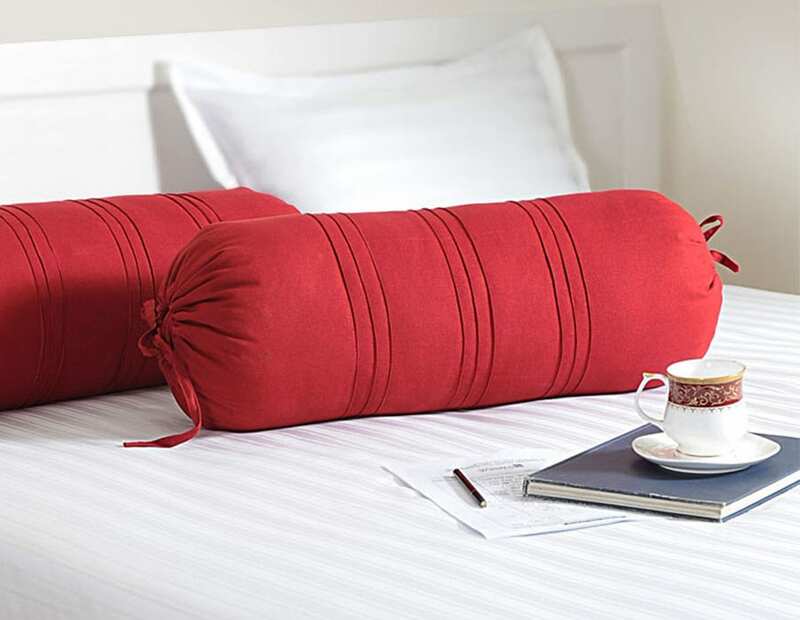 This is the standard pillow size which is usually the cheapest and the most compact. This pillow is also called jumbo and they will be 2 inches longer when compared to the standard pillow type. If you find a standard pillow to be to compact then the super standard is the one you want to go for. A queen-size pillow is going to be a little bit longer than the super standard and these are a good option for those that turn or toss at night or are moving their head a lot while they sleep. The king size is usually the longest pillow and these are perfect for those that turn and toss at night they can also serve as a headrest or a backrest for individuals who want to sit up in bed to watch television or read a book. The Euro size is a square shaped pillow and they come in different measurements. The larger Euro size pillow is suitable for a backrest or a headrest. Body style is a very wide pillow. This is perfect for those don't want to snuggle with the pillow throughout the night or need that want to snuggle with their pillow throughout the night or need one that is much larger than normal. You can get one of these pillows between 20 and $30 which are less expensive when you compare them to a regular down pillow. If you are allergic to regular down, a down alternative pillow can be the perfect option for you. This type of pillow is suitable for the side, stomach, and back sleepers. It will all depend upon their firmness, loft, and moldability needs. There is little to no odor with a down alternative pillow. Authentic down can have an unpleasant smell especially when the product is new. down alternative pillow is going to be more widely available when you compare it to a feather or a down pillow which might be harder to come by. You should get around two years use out of a down alternative pillow. They are usually less durable than other pillows. Some individuals claim that this type of pillow does not provide the support that they need. Some said they had more pressure or pain in the shoulders and neck when they used this pillow type. You need to fluff or shake your down alternative pillow more often than you do regular pillows so they retain their shape. A regular down pillow is basically silent but some down alternative pillows will produce a bit of noise when they are compressed. This noise may wake someone in the bed that is beside you. This type of pillow can lose its shape often during the night and it might become lumpy and add to your discomfort. A down alternative pillow is perfect for those that sleep on their stomach, side, or they're back. If you are a stomach or a side sleeper you may need a pillow that has a medium loft or a bit higher. A back sleeper will usually be comfortable with a moldable pillow. If you weigh less than 130 lb this pillow will suit you quite ideally if it has a low loft or a medium loft. If you have an allergy to down then a down alternative is going to be a great option because it is hypoallergenic and will not trigger an allergic reaction. If you tend to get hot at night this pillow will be ideal from you because it doesn't retain body heat and will usually be cool. If you weigh more than 230 lb you are not going to get the support that you need. This pillow will be too soft and it won't provide the loft that you need. If you experience shoulder or neck pain you might not get the support you need. from this pillow type as many people report below average support with this pillow type. If you have sleep apnea or other snoring issues you will require a firmer pillow that has more loft to support your head. If you prefer a higher loft pillow or one with more firmness you might want a different type of pillow. You will find a wide range of down alternative options. You can buy them through many brick-and-mortar stores as well as online through stores such as Amazon or similar retailers. You can expect to pay between a 20 and $30 and you'll rarely pay more than $80 for one of these pillows. The average cost for an authentic down pillow is going to cost you around 70 to $100 and some of the more expensive models can go upwards of $300. A down alternative pillow will also be cheaper when compared to a feather pillow which has an average cost of around $25 to $50. This pillow is machine washable and it doesn't have to be dry-cleaned so it is very inexpensive to maintain at your home. What Is Feather, Down, and a Down Alternative Fill? feather and down our natural feels that come from birds such as ducks and geese which we refer to as waterfowl. The down itself comes from the under plumage and this is found beneath the protective insulating layers of feathers. The down clusters will be wispy and soft and have filaments that will grow in multiple directions. Feathers, on the other hand, are found on the tail or the wing of the bird and they have quills or a shaft that runs through the center of. A feather is not as soft as down and it is less flexible. A down alternative fill is made from polyester microfibers and it is synthetic as well as man-made. This is not a common polyester fill that is used in very cheap pillows. A high-quality down-alternative will run around 60 to $100. The microfibers that are used to create a down alternative pillow are produced to high standards of feel and thickness. These pillows will feel luxurious and soft. Down is known to be an insulating material so it retains heat when you compare it to an alternative pillow. both a down alternative pillow and a down pillow can be more breathable and you will have a cooler sleep at night when you compare it to other types of pillows. This guide should help you purchase the best down alternative pillow to meet your needs. You have quite a lot of choice in the marketplace, so you should be able to find something that meets all of your requirements. The pillow is listed in this guide or a good starting point for you. Logged in as SnoreMagazine. Log out?